As a kid, I remember watching the Harlem Globetrotters every time they came to town in San Diego. My boys love basketball and would get a kick out of The Globetrotters now. Such great family fun. 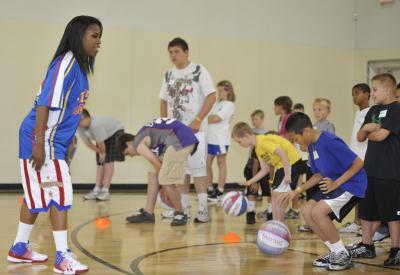 You ca now get your kids involved in the Summer Clinic with The Globetrotters.Now everything awesome - kids, basketball, teamwork, and having fun – comes together at destination awesome: Harlem Globetrotter Summer Skills Clinics, the ONLY clinics coached by stars of The Harlem Globetrotters!